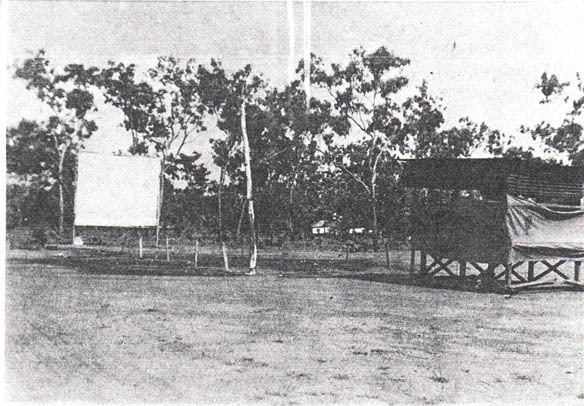 There were lighter sides to the War, such as the movies and the one USO show that stumbled into our area in Northern Australia. We did not have movies every night, but did have them no less than once a week. Of course, they were outdoors after the fashion of the drive-ins back home, except there were no cars, or popcorn, or girls! Using mostly scrap materials, a big screen was erected and a projection booth, much needed during the rainy season to keep the projector dry. The audience had options during the rain of either leaving, sticking it out under some improvised rain gear, or just sit there and get soaked. When it rained, various soldiers could be found exercising all of the above choices. 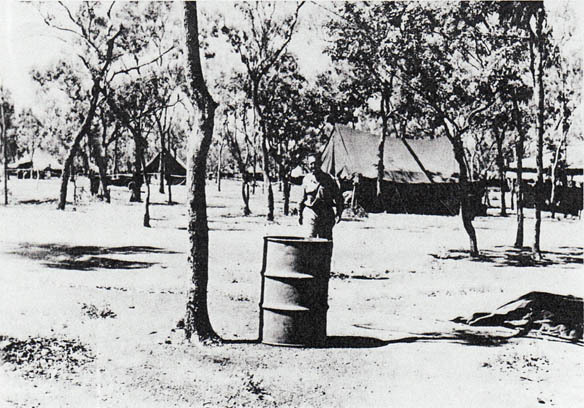 The attached Aussie Engineering Battalion could always be counted on to appear in force, bring their homemade stools, chairs, and whatnot to sit on. We office types would borrow the canvas folding chairs from the office and could view the movie in total comfort. It was as entertaining to watch the group assemble as it was to watch some of the sorry movies. Very few, if any, first runs were shown, but the Aussies drank in the experience and contributed a constant running commentary on the action on the screen. There is no way, in a civilized society, to reproduce their comments as they were more salty than salt! 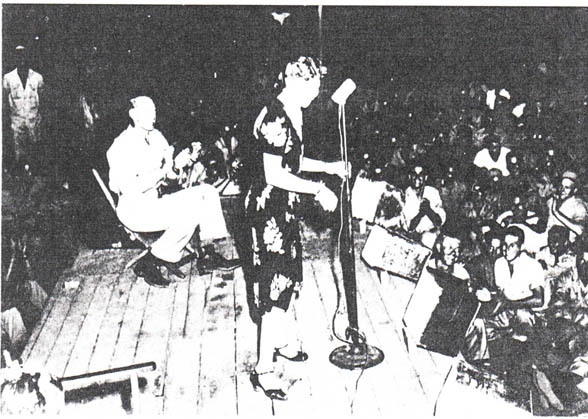 If a member of the audience felt the need for refreshments, he usually brought his own quart-sized bottle of that strong Aussie beer which sometimes added considerably to the level of festivity! We got what was left over as far as the USO shows are rated. I can remember at the time as feeling insulted. We dumb soldiers were supposed to feel grateful and elated beyond measure because some beat-up, worn-out, has-been movie personalities found time to come and display themselves; and display themselves is all they did, and I don't mean bare female bodies! With one exception, that being Gary Cooper (a longstanding favorite of mine), the rest could have stayed home. The intent is not to demean their effort, after all, they did volunteer. In my opinion, it was the fault of the management: poor planning and programming. The shows were not on the scale of the Bob Hope Shows! There was only one such show, so I was only disappointed once. General George C. Marshall, making an inspection tour of the theater, called in on us just once for a very brief visit. General Marshall, Chief of Staff of all the military forces, was in my opinion a man placed by providence, into the history of the United States, on about the same scale as George Washington was during the Revolution in 1776. Given the many problems of not being ready, difficult Allies to work with, and a global war on a scale never before experienced, he pulled it all together almost to perfection! After the war, when he was Secretary of State and devised the Marshall Plan for Europe's economic recovery, he struck the first blow in the Cold War against Communism! Once in awhile, the United States gets lucky. It was not possible to get very close to the General, what with everyone crowding around close to him, most wearing at least a silver leaf (Lt. Colonel), but I got close enough to him to look into his eyes, over a couple of shoulders between him and us, and I had a feeling of assurance! When I entered the military service, I thought I had good teeth, at least nothing hurt! However, while I was in Australia, things started to come unglued and a bunch of molars developed cavities that needed filling. Believe it or not, the 380th Group had two dentists and they were kept busy full time using Field Dental Equipment and set up for business under whatever cover was available. What they didn't have was running water or electric power. The water thing was no big problem because water-cooled drills were not yet in use. The absence of electric power was another matter. They had a piece of field equipment that the assistant could pedal and it generated a token amount of electric power (or pneumatic, I'm really not certain which). Of course, the power source could only drive the drill comparatively slow and it was torture to get teeth worked on. When the War was over and I returned home, it was with a mouthful of patched up teeth. The dentists were first-rate people who had given up a civilian practice (they were substantially senior to most of us) to help out with the war effort. No fancy dental work was accomplished, such as bridges or gold crowns or root canals or dentures. The military's intention was to fix the teeth so they didn't hurt the soldier because if his face hurt, he likely would not be able to shoot straight. The idea was to fix the problem just good enough so that the solider could function, but not too well, because he might be dead tomorrow. I think it was a rather cold-blooded approach, adopted out of necessity! While we were at Fenton, 100 miles south of Darwin, right in the middle of the "Outback," we would from time to time do a little exploring of the countryside. 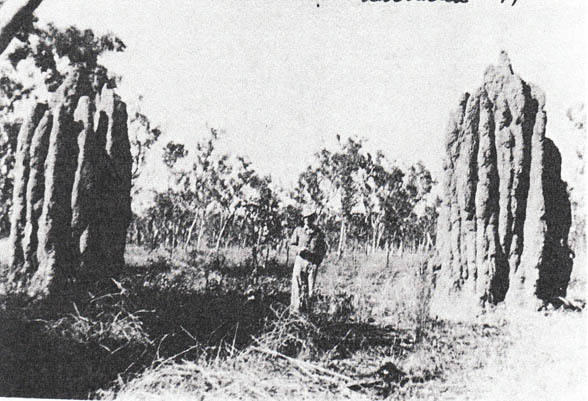 Anthills were the big thing, literally! Most times, a Jeep was available for a few hours and it could go anywhere the driver was daring enough to take it. Some of the hunters tried their luck without much result. 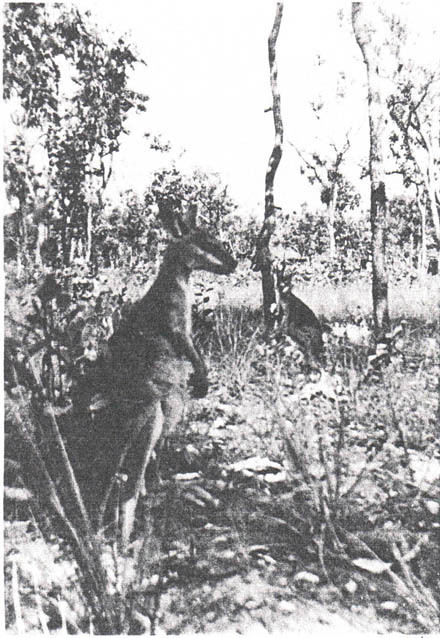 The little wallabies, the small kangaroos, were all over the place like rabbits in North America. They were fun to watch and harmless. If a person was brave enough to venture into the swampy areas, it was possible to meet some crocodiles (the Aussies called them Crocks) but there weren't many takers. There were also big old lizards, but they were not dangerous as they always ran. There were a couple of small rivers, more like big creeks, that were within commuting distance of the base by Jeep. They were called the Daly and the Adelaide (no relation to the town) and a suitable swimming hole was soon found and used, but only by the bravest! In the tropics, or semi-tropics, the lands are filled with creepy crawly things which the white man's body doesn't recognize and has no immunity to. There were many many evenings with little to do and in the evening life often centered around the tent and one's tent buddies. I can no longer remember the process that led to the selection of one's tent mates, but was almost like a marriage; sorta like forever and there was little or no shifting around. So if one made bad choices of tent mates in the beginning, relationships could be difficult for a long time. I was very fortunate and had wonderful tent mates. 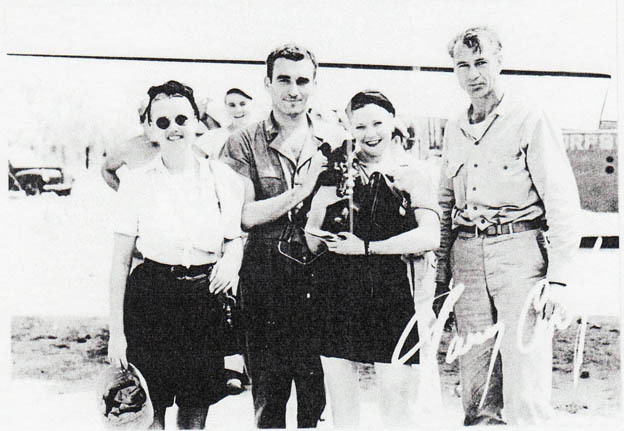 We were quite a mix and lived together for almost the total period of Foreign Service. We learned how to stay out of each other's way without being aloof and yet provide comradeship. In the military, like everywhere else, a pecking order develops. 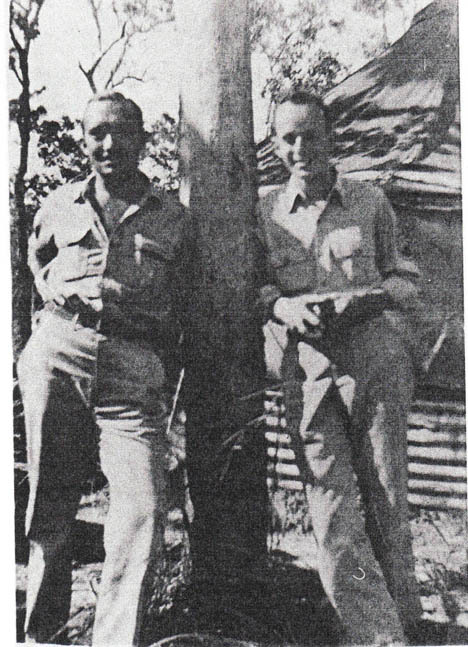 My tent mates were: my friend Ralph Finch, M/Sgt Mulholland, my immediate supervisor; T/Sgt Renwick M. Ballenger, of S-1, and one other whose name has been forgotten (he was also of the S-1 section and took First Sergeant). Gamble was one of the original five in the tent (he didn't stay long with the Group, maybe 6 months). Mulholland, Ballenger and Gamble were at least 10 years older than Finch and me. These three were heavy drinkers and preferred whiskey, which was hard to get and then only Australian brands. One in particular I remember was Milnes; drinkers would mix it with Coke, lots of it available, and they would sip and mix all evening. Finch and I would just sit and listen to the three senior mates tell yarns. 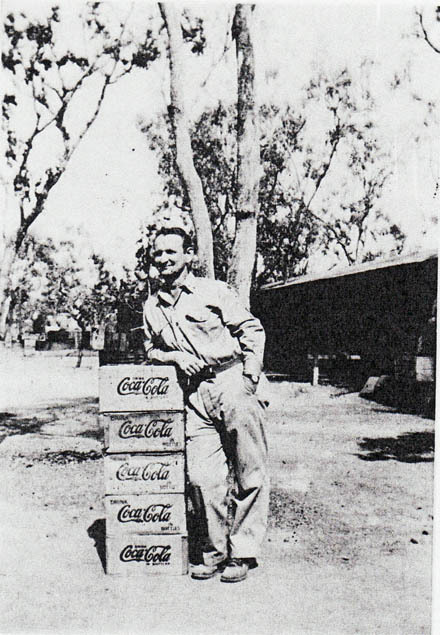 Mulholland, having been a Coca Cola distributor in civilian life, had hung out in a lot of bars in the course of his workday and accumulated a lot of stories. Finch and I spent a lot of evenings in the office building where there were electric lights, as the only illumination in the tents were a candle or a small kerosene lamp, not enough to read or write letters by. All the letters I wrote were by hand and the struggle was to say something of interest when all things about the War were strictly forbidden. The Officer in each Section had to read our letters; they were the censors. A soldier often hesitated to get into personal matters in the letters as all forms of privacy were non-existent. That didn't leave much to write but "I'm fine, how are you? "!